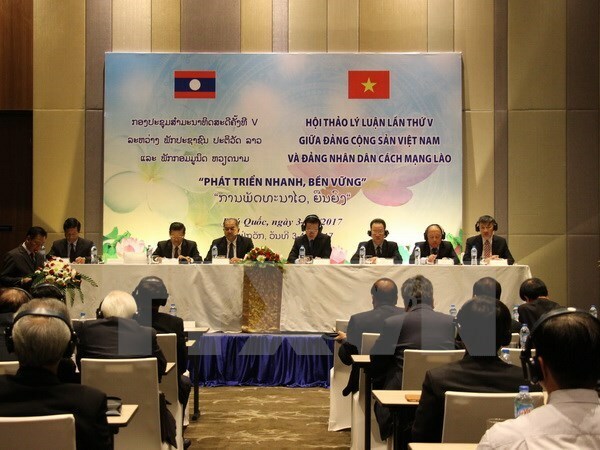 Kien Giang (VNA) – The fifth theoretical workshop between the Communist Party of Vietnam (CPV) and the Lao People’s Revolutionary Party (LPRP) concluded in Vietnam’s Mekong Delta province of Kien Giang on August 4, focusing on rapid, sustainable development. Reports presented at the two-day workshop made it clear factors decisive to sustainable development in Vietnam and Laos, and analysed their practical experience in this field. They emphasised the key role played by the Party leadership in rapid, sustainable development. The participants also touched upon political stability, international integration, national defence and security, economic development in combination with environmental protection and improvement, and human resources, which all have links with rapid, sustainable development. They held that economic development should be the centre, and Party building should be the key in rapid, sustainable development. Besides, it is necessary to regard culture and human development as a spiritual foundation, and ensuring national defence and security as a regular task, they said.